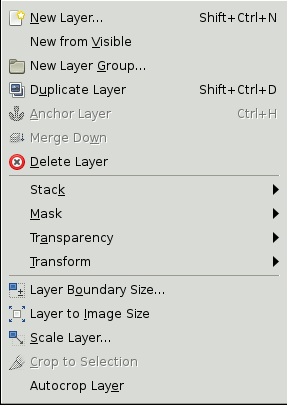 The items on the Layer menu allow you to work on layers. In addition to accessing the Layer menu from the Image menubar and by right-clicking on the image window, you can get to it by right-clicking on the thumbnail of a layer in the Layers dialog. You can also perform several of the operations on this menu by clicking on buttons in the Layers dialog, for example, resizing a layer, managing layer transparency and merging layers.